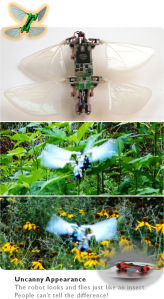 Robotic researchers at Georgia Tech have created a wonderfully scary robotic dragonfly. I have always loved flying my mini-helicopter around the house but it is difficult to fly and the battery only lasts a few minutes, tops. This appears to be the answer to all the problems. Just imagine the endless number of uses. Police and Fire departments, sporting events, photography, even the military (imagine pinpoint drone attacks where NO innocent civilians are hurt) could benefit from such technology. Yes, the good always comes with the bad. You can imagine just as many bad uses for such a device. But let's face it, if we always focus on the bad things, we are destined to a life of suffering and disappointment. Read all about it here at Tech Crunch. I think I'll just upgrade my phone instead. I just can't see the need for a tablet when you have all that in your pocket. Nice review from Apple Insider. Apple's new iPad mini is likely to become its most popular iPad, due to a light, thin design that delivers tablet optimized apps in a more portable package at a reduced price. What is the iPad mini? Apple's new iPad mini, at first glance, appears to be an attempt by the company to annex the only portion of the tablet market it doesn't already own: the niche between the new 4-inch iPod touch and the full sized, 9.7-inch iPad. Amazon, Google and a variety of other Android licensees have attempted to establish a position in 7-inch tablets that they can use to grow upward (and in some cases downward) in size. To many observers, the iPad mini is simply following this trend, albeit with a significantly more expensive entry point. Apart from price, critics are also complaining that the iPad mini lacks the high-end Retina display of the latest iPad 3 and 4 (and Apple's most expensive new MacBooks, and all models of iPhone and iPod touch currently being sold). However, looking at the iPad mini as a low end, 7-inch rival is just as misleading as the perspective of those who saw the original iPad as a poor netbook option saddled with such flaws as not having a physical keyboard or mouse and lacking the ability to run conventional desktop apps. People who thought that in 2010 were blindsided by the success of the iPad and the collapse of netbook sales. Similarly, the iPad mini is not a cheap, low end tablet trying to establish the first rung of a new platform by stretching some existing smartphone apps across a larger screen. Instead, it's a reinvented iPad, designed to be as thin as the company's newly released, 4-inch iPod touch and iPhone 5 while running the full library of tablet-optimized App Store titles (and a wide array of custom corporate apps being used in government and the enterprise) that fill out Apple's full sized iPad ecosystem. Most of the critical engineering decisions Apple made in the design of iPad mini were clearly aimed at delivering a functional and popular mobile device, not just a very low priced one. Apple could have reached lower into the bargain bin to give it A4 "celeron" power, created an entry point offering a paltry 8GB of storage, or relied on other OEMs to crank out a generic, thick slab of plastic and simply label that product with the sales power of its "iPad" brand, all of which are commonplace practices in the tech industry. On the other hand, Apple could have sourced a mini-sized iPad Retina Display, paired it with its new A6X processor and 128GB of storage, and sold it to a few million people who would pay anything (probably around $1200) to have the latest iPad device. Instead, Apple gave the iPad mini specs comparable to iPad 2, but reduced in size. This reduction sheds a lot of weight (from 1.33 lbs or 601 grams to the iPad mini's 0.69 lbs or 312 grams). In addition to its new thinness and more hand-friendly rounded rectangle shape (shown below, next to iPad 3 and iPhone 4S), this huge weight reduction makes iPad mini far more portable. It's still too big to stick in your jeans pocket (a smartphone level of mobility that Steve Jobs said no tablet could realistically offer), but it's effortless to hold or carry around. It's a very different kid of iPad experience. It makes full-size iPads feel clumsy and heavy in comparison. In addition, the new iPod touch/iPhone 5 body style of the new iPad mini also makes it easier to hold, and its two-thirds size makes it both easy to grab in one hand and much less of a stretch to thumb-type or play games on when held in landscape orientation. It feels a lot more like a "big iPod touch" than the full sized iPads, but this comes at a cost: the screen is scaled down. Text on the screen is smaller, but interestingly, the title bar and lock screen text and graphics that appear about 60 percent smaller than other iPads is now about identical to the size of those elements on the iPhone. This evokes memories of lugging around a 17-inch MacBook Pro until realizing that, if you can get the same resolution in a smaller, lighter machine, why wouldn't you? 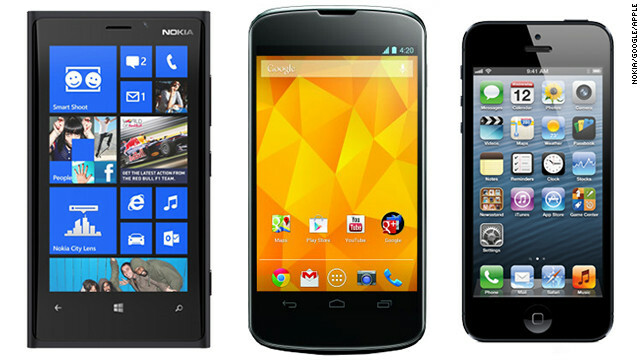 Which smartphone system is right for you? I am waffling on changing phones right now. Here is a nice little guide. Google News refresh places Google+ at centre: Google News is undergoing a makeover and has embedded content from Google+, its new social network, into its refreshed look. 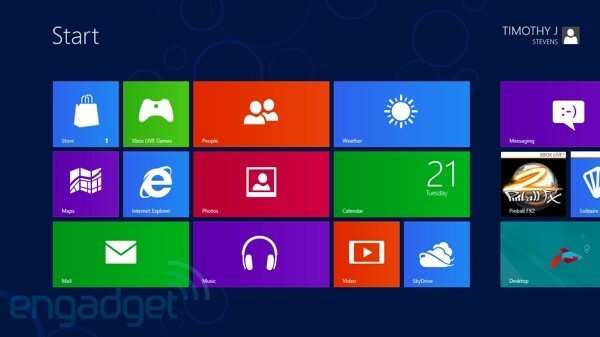 How pumped are consumers about the release of a Windows 8 preview that they can call their own? Quite, according the million downloads the build has marked in just a day. That number comes from Microsoft's Building Windows Twitter account -- of course, it's important to note that the number doesn't necessarily mean one million individuals downloaded Consumer Preview. Still, not bad for a day's work. Yesterday I went to the 2012 Toy Fair, and to be honest I was really disappointed. I’m 23 years old, and I’d estimate that 90 percent of what I saw yesterday was a variation of a toy I played with as a child. My 50-year old parents might even say the same thing. There were more stuffed animals than I care to remember, lots of toy guns and building blocks, and plenty of R/C cars and the like. But some toy makers were more innovative than others, with a couple actually trying to reinvent the wheel (or the bike, more honestly). One company, CycoCycle, takes on the challenge of riding a unicycle by making a sort of unicycle-tricycle hybrid. It sounds dumb, but I can actually see kids picking this up. The seat is placed directly above the main, front wheel and dips a bit to keep you in place. From the seat comes two tricycle-style bars that connect to smaller wheels. It’s more difficult than riding a bike, and feels totally different. Kids can learn an entirely new set of tricks with this thing, and throw a kid sister on the back to ride along courtesy of a rear step bar. Plus, that same rear step bar allows for scooter-style riding and the tricks I mentioned earlier, and you’ll see clearly in our video that neither John nor myself can do any of them. It can also fold up for easy transportation should you want to lug it to a park or beach. The CycoCycle can be had for the odd price of $82.69 at Amazon.com. Another interesting, albeit seemingly dangerous, wheeled device that we saw is the Solowheel. Actually, the Solowheel is more of a transportation vehicle than a toy, but whether it'll be used for fun or transportation will be up to the owners. The Solowheel runs on a rechargeable lithium-ion battery and a 100-watt motor, and can run for 15-20 miles at 10mph before crapping out. It takes about two hours to recharge, so if you live close to work in a relatively mild climate then this might be a solid idea. Just like an electric car, the Solowheel generates energy going downhill or slowing down. It was bit difficult for me to get used to, but I'm sure with time I could have a lot of fun on one of these. The PR girls rolling around on them were even comfortable enough to text while driving. Gamers, start your engines, lift your fruit-slicing swords, and lace up your Temple-running shoes. Game Center, Apple’s gaming/social hub for iOS, has finally made it’s way over to the more mature Apple OS, OS X Mountain Lion. This is huge. Not because you’ll be able to enjoy the features of Game Center while playing around on your Mac (which will likely be great fun, too, I’m sure), but because gaming will now bust through the platform barrier allowing you to duke it out with anyone on just about any Apple device. That’s right. We’re no longer in the era of PC-to-PC/phone-to-phone gaming as OS X Mountain Lion will enable Mac-to-iPhone, Mac-to-iPad, and Mac-to-iPod touch gaming. Like I said, that’s huge.